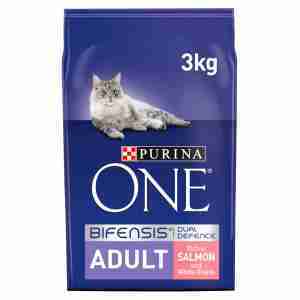 Purina ONE Adult Salmon and Whole Grains is specifically formulated to meet the complete nutritional needs of Adult cats (+1 year) who need a complete and balanced diet to help stay in the best of health. The feed is formulated with yeast, prebiotics and antioxidants in order to help support your cat’s natural defences. Purina ONE helps support the immune system for the years to come.